I’ve known Toni for many many years so when I got my first dog I decided to take her to Toni to be groomed. 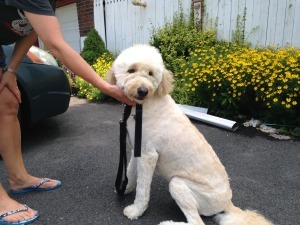 The first time I dropped Lilly, my golden doodle, off to be groomed I was very nervous. I told Toni the exact look that I was going for and she certainly delivered! Someone once told me that you can tell the kind of experience that your dog had at the groomers by the way they react when you bring them back to the groomer the next time. Lilly’s tail does not stop wagging from the minute she gets her out of the car. I can’t imagine taking Lilly to anyone else.